Masonry Barbecues originate from the Mediterranean where alfresco dining is a way of life. The moulded concrete, charming colours and unique physique makes them an intriguing feature to any garden or patio. Our masonry barbecues can be painted over to match any garden design scheme giving you a lifelong barbecue that can be brought back to life whenever you feel is necessary! These masonry barbecues are easy to install and come with FREE delivery. The installation will require two people and can also be used as a storage place. Investing in a masonry barbeque will allow you to not only have a place to cook outside but it can also double up as an outdoor fireplace, perfect for winding down your evening after a long day at work or simply to relax towards the end of a party. Using solid fuel such as charcoal to ignite your masonry barbecue means that it is easy for you to get started on your cooking and enjoy the great smoky aroma that will follow. 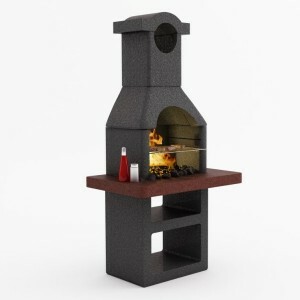 Add some culture to your patio, garden or seating area with these great focal masonry barbecues. Get yours now! The Firenze Masonry Barbecue has a premium contemporary style with smooth lines that are easy on the.. The Miami Masonry Barbecue has a sleek, modern design aimed at creating a contemporary centerpiece f..
Bring a touch of the Mediterranean to your garden with this fabulous Italian Masonry Barbecue. Th..